CáF63. Darkest of batch. Dark dark red. Heat. Mid-to-light, much lighter than colour. Still a hint of plum. Despite Spartan description, much liked by me. 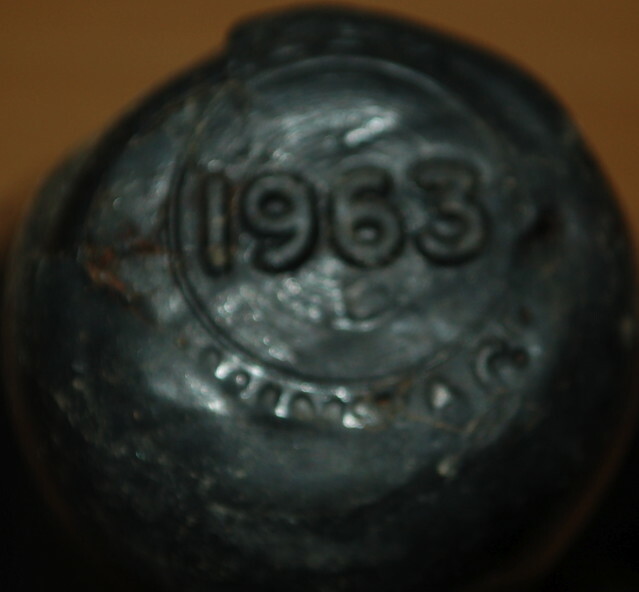 The darkest wine of all the 63s, very good, but a tad fiery. very dark black red color; caramelised, brown slightly burned sugar smell; dark cherry fruit on the palate; meaty; good length, tastes a bit after good tasting coughing sirup; suggery and candy finish; very nice port! Deep red, very dark; 95% opaque. Gentle nose of rich Christmas cake fruit. Luscious and rich on entry, bringing very attractive concentrated ripe cherry and a bit of peppery sage. This has a great palate. Rich and concentrated cherry finish, very enjoyable. Fine vintage port. 93/100. Drunk 12-Oct-13. Decanted 11½ hours.